It was quite inspiring to read in last week’s article Hill Street blues: must keep barriers, (The News, July 29) about how residents on Hill Avenue are trying to convince the District of Maple Ridge not to remove the barriers on their street. The district feels it’s desirable to offer their street as an alternate route to cars to the 102nd Avenue and 240th Street arterials. Understandably, residents worry that traffic will increase on their quiet street once the barriers are gone. Motorists may use their street as a rat-run, trying to avoid the traffic lights at the 102nd Avenue and 240th Street intersection. They organized a big street party and a petition to show how passionate they are about keeping their neighbourhood safe and quiet. Only two months ago, the Vancouver Area Cycling Coalition did a Bike to School program – the first in Maple Ridge – at Albion elementary, right across 240th Street from Hill Avenue. This program was funded by the District of Maple Ridge. As part of the program, a Family Bike Festival was held. The kids learned about traffic rules, how to manoeuvre their bikes around pylons, how to properly use their helmets, and they decorated their bikes. At the end of the afternoon, a group of about 60 kids biked through the neighbourhood. I was helping out on that day, and I thought it was the greatest sight, all those kids cruising down Hill Avenue. You could see how thrilled they were to be in control. Quite a different experience for a lot of kids from being strapped into a car seat when being driven to school every morning. I was hoping that this Bike to School program would be the start of an important road to independence and learning for many of these kids. Many kids these days don’t learn much about how to behave in traffic, since their parents drive them everywhere. Once they turn 16, if they manage to correctly answer some multiple-choice questions about the rules of the road, suddenly they’re allowed to be in control of a three-tonne vehicle … and all those years we tried to keep them safe by not allowing them to bike other than in our quiet cul-de-sac or on the sidewalk! I wonder how many drivers have asked the district to remove these barriers. I suspect none. I doubt too many residents – if any –on either side of the barriers want them gone, because everyone wants to live in a quiet neighbourhood. Neighbourhood streets shouldn’t be used for through-traffic if it can be avoided – only for local traffic. Leaving the barriers in place may encourage more parents to allow their kids to bike to school. As more development takes place in east Maple Ridge, sooner or later there will be traffic lights at the Hill Avenue and 240th Street, which would make Hill an attractive alternative for drivers. And once the barriers are gone, it’ll be much harder, or perhaps impossible, to get them back. So I say: kudos to Hill Avenue residents for standing up for their kids and their neighbourhood! • The Summer Cycling Photo Contest organized by the Maple Ridge/Pitt Meadows bicycle advisory committee. 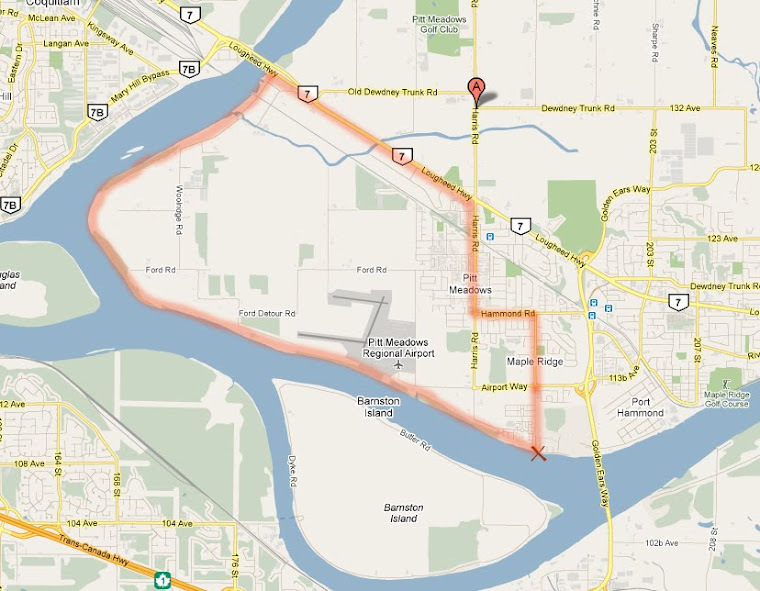 You can find details at mapleridge.ca (click on “contest” under “What’s New”). Check out the awesome prizes! • Our Discovery Bike Ride for this month will be Aug. 20 to the Greenest Household in Maple Ridge. Suitable for cyclists of all abilities. Check out details on our blog: rmcyclist.info/. Note that our rides are unguided. • An exciting event is being organized for Sept. 24 by the Golden Ears Transition Initiative, of which the VACC is part. I’ll tell you more about it in next month’s cycling column.